Nerf N-Strike Elite Rough Cut 2X4 Blaster | A Savings WOW! Today only, Monday, July 21st, get this Nerf N-Strike Elite Rough Cut 2X4 Blaster & Elite Dart Refill Bundle for only $14.49 at Kmart. The regular price is $28.98, so you are getting an awesome deal! 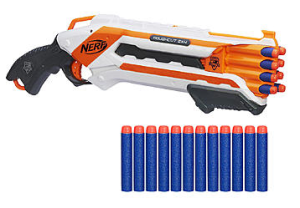 The Nerf N-Strike Elite Rough Cut 2X4 Blaster WITHOUT the refills is $19.99 at Toys R Us and $19.97 on Amazon.com, so you are getting it for less PLUS getting the refill! Get it as a fun thing to do this summer or as a fun gift to give. You can select store pickup for free or have it shipped to you.